December 24, 2009 Dan O.
It’s always being played on USA, you had to know this one was going to come. When young Buddy falls into Santa’s gift sack on Christmas Eve and is inadvertently transported back to the North Pole, he’s raised as a toy-making elf by Santa’s helpers. 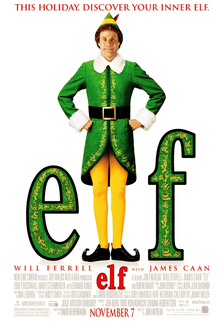 After growing up to be a misfit who never quite fits in, the outsized elf (Will Ferrell) decides to go to Manhattan and find his real dad(James Caan). I have probably seen this about 300 times. First time ever I actually went to the movies when this first came out and I really liked it, and as I got older nothing really changed I still liked every time the same way. This film is not such a laugh out loud comedy as there are a lot of grins involved. Director and writer Jon Favreau really does handle this film with the comedy you wouldn’t expect from a Will Ferrell movie. It’s basically for all ages: kids, teenagers, adults, and maybe even some senior citizens. Will Ferrell gives a very charming and hilarious performance here, as you would expect him just to be hamming it up the whole time, but I think this is the one film that really did start him to become comedy’s leading man in Hollywood today. James Caan is such an odd choice for this film considering all the other stuff he’s been in, but really does fit in with this film suprisingly. The only thing that I have noticed that the problem with this film is that it does at points start to lag a bit in parts. Especially at the end where they start to discuss about Santa being all real, and this all felt a little to out of place, but in the end it really didn’t matter. I can’t really say that this film is the most amazing piece of work ever, but it is one of the modern Christmas Classics. I have a feeling now in about 10-20 years people will be watching this film, the same way people watch A Christmas Story around this time. That’s just my assumption, but you never know it could happen. Consensus: Elf has a timeless message with a charming performance from Ferrell that really does make this film shine even more, and become a modern Christmas Classic. This movie also launched Jon Favreau as a mainstream director. I thought the movie was quite hilarious when it came out but Will Ferrell’s act has worn out badly and it’s not as charming after you have seen his next 10 movies where he is exactly the same. Ha. I’m actually a little opposed to Caster. The first time I saw it I was hugely disappointed. I expected humor over sweetness and as it turned out it was a very sweet movie. While I agree I’ve grown tired of the repetitive Will Ferrel flicks, this one is definitely better around the holidays than a lot of other junk plaguing cable tv these days.